Developed by Elizabeth Jones and only available here. What is Zodiac of Light? 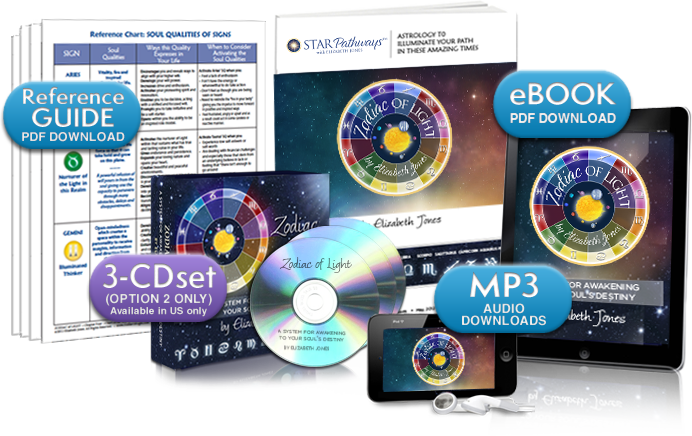 Zodiac of LightTM is simple-to- use system where you will discover the spiritual qualities that emanate from each of the twelve Zodiac signs plus you’ll learn how to activate the Celestial Codes held within each sign through the radiance of the Sun. In Zodiac of Light (ZoL) you will learn why you carry within you a Celestial Code for each of the twelve Zodiac signs and then how to access the “Soul Qualities” and “Soul Identity” of each sign which are actually what our Soul came here to learn*. Plus you will see why it is important to activate them at this time of transition on the planet. For as you do, you are aligning with the truth and warmth of your own Soul, which will help you to align with the energies streaming forth at this time. Would you like to learn what the signs of the Zodiac mean from a more spiritual perspective? If gazing at the night sky brings you a sense of awe and peace then Zodiac of Light is for you! In ZoL you’ll discover the impact of the Zodiac constellations and their roll is in your Soul’s purpose this lifetime. Even if you’ve never really studied Astrology you’ll discover things about your Sun sign (the sign you were born in) that will open you to seeing your path like never before. If you are a student of Astrology you’ll learn things about each sign that will help you to better understand the true meaning and purpose of the Zodiac signs, allowing you to see a birth chart in new ways. Utilize– in ways never known before– the mystical energies of the cosmos. Attune to the increase of Light available at this time. Receive assistance from the cosmic energies that emanate from the Zodiac constellations to help you deal with any challenges while raising your vibration in the process. Learn how to connect with the Soul Qualities that emanate through each sign. This truly is Astrology as you have never experienced before…and you do NOT need to be an astrologer to avail yourself of this revolutionary system. Order Zodiac of LightTM Today! You can purchase Zodiac of Light with or without CDs. Download the entire system immediately! Zodiac of Light eBook – An 84-page, beautifully designed, easy-to- read and print-friendly PDF with information on ZoL, including how to use it, the origin of this amazing system, insights into each sign of the Zodiac and more. 19 Tracks as MP3s (including one for each sign), as immediately downloadable MP3s (CDs also available…see below). “Thank you for the profoundly useful ACM for this month. I felt so strongly your desire to be of service as we face these trying times. You truly gave me a roadmap to stay grounded and move toward higher frequencies. It was a relief to hear your carefully chosen words as you warned us of huge energies without scaring us to death! I will refer to your insights all month to keep me on track, inspired and grounded. how the content and events are unmistakably coinciding with my life situation now. I have been a dedicated member of ACM and look forward each month to listen. Many, many thanks Elizabeth. As an Astrologer and student of metaphysics and spirituality of many years, I’ve come to see Astrology as the language of the Cosmos—yet often wondered why we can’t access the insights it offers to everyone more directly and easily? I have always felt that there must be a way to glean the wonder and wisdom found in Astrology—yet without having to study for years! Over time I began to see and experience this mysterious world differently as I attuned to the celestial patterns that replicate themselves in our lives, rhythms that pulsate through our beings and insights to guide us throughout the twists and turns of our life. Yet I could feel that there was something else…and eventually (almost magically!) I came to know the dynamic, living presence that emanates from the constellations and the planets as a kind of Celestial Light. I discovered that this celestial presence also exists within our being and our soul…and the connection between the heavens above us and the Light within us started to reveal itself within my own being. As I embraced this deeper purpose and meaning of the Cosmic Light that shines through the planets and constellations many things began to make sense and Planets and Light and Zodiac of Light was born. The overall concept developed over the course of several months and years. A deep part of each one of us knows we are being sought and called Home, and it is my hope that this material will resonate within you and even feel familiar and comforting. My hope is that it will further you on your journey. In Planets of LightTM you discover that we can engage the Planets to assist us in igniting our own inactive or trapped Light. This is a thrilling and extraordinary idea and one I have never seen elsewhere. The connection between the Light of Creation, the Planets as Great Guardians of this Light and then to each of us is the key element, the alchemy, if you will, that creates Planets of Light to be the wondrous and unique gift that it is. *In Zodiac of LightTM you learn how each of the twelve signs hold the celestial codes for all of the qualities our soul incarnates to learn. These are embedded within you and can be activated by the Sun, through the processes given in ZoL. Decades ago my grandfather and teacher told me “the 12 signs of the zodiac represent the qualities we are here to learn.” This simple statement has always intrigued and was the impetus for me to discover more about why this is so. Zodiac of Light the result of years of study, and it is my hope that it will help you to discover the Soul Qualities that reside within you, awaiting discovery.